I am sure by now you’ve heard that the U.S. was unsuccessful in their quest for their first ever victory in Mexico’s Estadio Azteca. Unfortunately, the 24th trip to Mexico City would be no different then the previous 23 for the American squad. And although the U.S. did lead early in the match (their first lead ever in Mexico) the club faded away by the end of regulation losing 2-1. The frustrating result has left critics everywhere asking: Why can’t we win in Azteca? Is it the unbearable heat? Or the high altitude? The pressure of being the away club? Or is it simply the grand design of the stadium? Pack filled with well over 100,000 rapid soccer fans, the Azteca is the fifth largest football venue in the world. 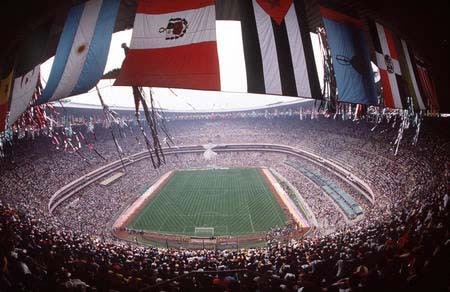 Built originally for the 1968 Summer Olympics, the Azteca has hosted two World Cups (1970 & 1986) and the first ever NFL regular season game outside of the United States. But for all the wonderful memories the stadium has encompassed over the years, I still think of two people when I think of the Azteca. The first is Pele. Arguably the best soccer player ever, Pele led Brazil to the World Cup title nearly five years after the stadium’s construction in 1970. The second person is Diego Maradona. Maradona was the 1986 World Cup MVP and led Argentina to the World Cup title. That was the infamous “Hand of God” Cup in which the star player batted the ball into the net with his unseen fist. Briefly following the goal was the legendary “Goal of the Century.” The two plays lifted Argentina over England 2-1. Outside the Azteca stands a bronze statue highlighting Maradona’s game winning play. For the U.S. to win in the Azteca they too will have to make the spectacular, game changing play.